Simin (Leila Hatami) plans to leave Iran with her husband Nader (Peyman Moadi), and their intelligent, sensitive 11 year old daughter Temeh (Sarina Farhadi) in search of a better life abroad. When Nader refuses to leave his Alzheimer-suffering, incontinent father (Ali-Asghar Shahbazi) behind, Simin files for divorce. When the court rejects her application, she leaves the family home, and moves in with her mother. Nader is forced to care for both his father and Temeh, who chooses to stay with him. Hoping for some normalcy in his life, Nader hires Razieh (Sareh Bayat), a housekeeper, to help with the house work, as well as to care for his father. However, events spiral out of control when Nader arrives home one day to find his father alone, unconscious, and tied to his bed. Venting his anger on Razieh, Nader would eventually cross the path of her ill tempered, volatile and prone to violence husband Hodjat (Shahab Hosseini). The stage is set for a terrible confrontation. Written and directed by Asghar Farhadi, A separation is a delicately balanced film that explores some of the most complex religious, social, and political codes of modern Iranian society. The film deals with such controversial, and politically sensitive issues as theocracy, gender oppression, social justice, and a deeply rooted class structure. Farhadi succeeds in avoiding conflict with the censors by cloaking the elements of what is essentially a political film into what appears to be every-day(non-political) terms. This is precisely where Farhadi's genius comes into play. At the opening scene of the film, Simin and Nader are facing an unseen judge who asks if she believes her daughter has a future in Iran. Thus, the political message is undeniable; the divorce is a metaphor for Iran, and by seeking to divorce Nader, Simin is essentially seeking to divorce Iran itself, in order to secure Temeh's future. However, things are not as simple. Our couple are evidently still in love. The dilemma they face is not uncommon to the one faced by millions of Iranians today - stay and fight for a better future, or escape to a better life abroad. While Simin and Nader have this choice, the other couple, Razieh and Hodjat, certainly don't. Being from the wrong side of the class divide, their only choice is to fight. 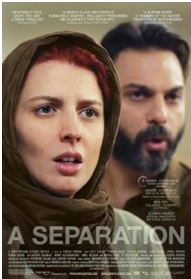 A Separation has a superb ensemble cast, with top notch performances from Hatami, Moadi, Bayat, Hosseini, and Shahbazi. Sarina Farhadi is outstanding as the long-suffering Temeh. In real life, she is Farhadi's own daughter. Shot in documentary style, A Separation is a vividly real, and incredibly intense drama that will hold you spellbound for its entire 123 minutes. Not surprisingly, it has won every imaginable award including this year's Academy Award and Golden Globe for Best Foreign Language Film. Perhaps a true measure of the film's greatness lies in the fact that filmgoers in Israel are queuing in their thousands to see it. A Separation is easily one of the best films to come out in the past five years. Recommended viewing.